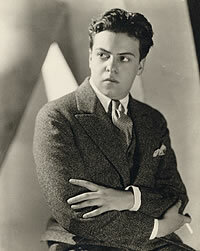 One of my cultural heroes—on so many different levels—and someone whom I unquestionably emulate is the Mexican artist and scholar Miguel Covarrubias. I first learned of him during my Maya studies when I read his theories regarding the "mother culture" of the Olmecs and his graphic illustrations of cultural diffusion. Later, I became familiar with his caricatures for Vanity Fair and his social skill for interacting with so many of the best artists of his time. Along with Anaïs Nin, Rosa and Miguel Covarrubias were models to me of individuals who chose to live at the hub of culture; my ultimate dream. With regard to film, Miguel and his wife Rosa were both part of the "mexperimental" film movement outlined by Jesse Lerner in his exhibition catalog of the same name. That movement was just one of the many topics I could have written about for Girish Shambu's blogathon on avant garde film. I hope to massage that information at a future date. In the mid-90s Adriana Williams published a biography on Miguel and Rosa Covarrubias. At the time I was doing programming for a Bay Area arts nonprofit called The Friends of Ethnic Art and I invited Adriana to speak for our organization. We became good friends on the basis of that invitation and each year at the San Francisco International, I catch up with Adriana (who loves international film as much as I do) and further our friendship while we wait in lines, often to see the same films. Dave Hudson's Greencine Daily reminder that today would have been John Huston's 100th birthday reminded me of Huston's interaction with Miguel Covarrubias and I thought my readers might be interested in some of Adriana's research regarding their friendship. She interviewed John Huston for her book in Los Angeles, 1986. Huston himself had also written about Covarrubias in his autobiography An Open Book. Here are a few excerpts from Adriana's wonderful study, with my sincere thanks to her for her erudite passion. In 1929 Miguel [Covarrubias] met the as yet unknown John Huston, who had arrived in New York that year with a script under his arm based on the "Frankie and Johnny" legend. Huston had written his version of the story as a puppet show for a young puppeteer named Ruth Squires, who persuaded Sam Jaffe to compose some incidental music for it. The show debuted at a party that George Gershwin hosted and for which the famous composer performed Jaffe's score. The production was written up in the New York Times, where Charles Boni read about it and was inspired to pair Huston with Covarrubias to collaborate on a book. The result, published in 1930, is a richly illustrated collection of various versions of the well-known song, including Huston's and thirteen others. One reviewer declared: "This book is not a Huston book: it is a Covarrubias book. There is very little that can be said in words of Mr. Covarrubias' illustrations. To describe them requires both line and music. They should be seen to be sung." Huston became a close friend of the Covarrubiases and remained so. Nearly twenty years after they had collaborated on Frankie and Johnny, Huston was in Mexico shooting The Treasure of the Sierra Madre, one of the first American films to be made entirely on location outside of the United States. Huston had chosen Tampico on the northwest coast of Mexico as the set for his film, and he was shooting pre-production material with a small crew when a local newspaper published the rumor that the Huston film was anti-Mexican. Huston claimed that the local Mexican population "had risen in righteous indignation and threatened us, going so far as to throw stones at our camera crew." None of this was true, but it attracted media attention, and soon Huston received word from Mexico City to discontinue filming. John Huston, An Open Book (New York: Alfred A. Knopf, 1980):143. What a great, personal tribute to Huston on his centennial day! 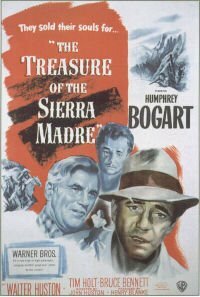 There are so many Huston films I haven't seen yet, but of those I have the Treasure of Sierra Madre is my favorite. Fascinating to learn of you connection to a key player in the making of that film. Thank you, Brian. I adore "Treasure of the Sierra Madre", on so many different levels. Walton Huston is a joy to experience in that film. Alfonso Bedoya shines as a bandit.